The cost of laundry products can really add up over time, especially if you have a large family like we do. Did you know you can actually make your own reusable dryer sheets to stretch a bottle of fabric softener across many more loads? I think this is a great idea… especially with the packets of free samples of fabric softner since I don’t use it in my washer. 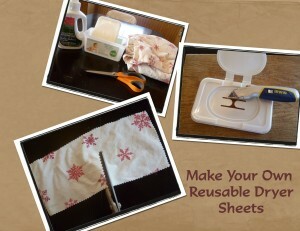 I ran out of dryer sheets once and made my own sheets with an online recipe using hair conditioner. It was a huge “FAIL!” My stuff came out full of static as if I didn’t use anything. I have washcloths that I bought at Family Dollar, (30 for $5), and I use them for all sorts of things around my house. One thing I use them for is dryer sheets. I have fabric softener in a spray bottle, the kind you get in the health and beauty section of the dollar store, and I just spray about 5 sprays on a washcloth and toss it in the dryer…it works great! i won’t need dryer sheets for years!!!! with the gain coupons that were out a few weeks ago, i was able to get about 40 boxes of fabric softener sheets (80 count) for 12 cents each!!! but IF i ever run out…i might try this…. I tried this idea about 3 yrs ago using Downey & some washrags. The ratio was 1 part fabric softener to 3 or 4 parts water. I’m not sure if the rags were too wet when I put them in or if it was because I used downey but I was left with a whole bunch of greasy looking stains. I tired again & even squezzed out the excess from the rag before using & again a whole lotta greasy looking stains. I think I had to wash & rewash those loads at least 3 or 4 times.